Dr. Davia J. Crutchfield will be visiting Hope’s campus this week. Check out our interview with Dr. Crutchfield. She discusses her Women’s Studies certificate, the value of WGS courses, her research inspirations, and more. What are you most excited to share with students, faculty, staff, and community members who will attend your lecture on Thursday, November 8? Honestly, I am most excited for the conversation following the lecture. I am eager to engage with Hope’s academic and surrounding community about secular rap and spirituality. I think the dialogue will be compelling and motivational. Did you major/minor in Women’s and Gender Studies (WGS), and if so, how did your WGS major/minor/certificate shape you? If not, how did you come to WGS as an academic discipline? I completed the Women’s Studies certificate as part of my Master’s program at Howard University because I wanted to critically examine social and spiritual issues faced by Black women. Taking part in a Women’s Studies Program at a Historically Black College and University (HBCU) provided me a space to explore Black women’s varied experiences, and I became aware of my own biases. I was more conscious of the varied ways oppression shows itself in various areas, especially in the areas of women’s contributions to various disciplines, spaces, art forms, and more. What difficulties, if any, did you have reconciling your faith with your Women’s Studies certificate? This is such an interesting question because I do not think I was conscious of how my learning impacted me until I recognized that the questions I was asking myself and others changed. For example, a couple of years ago I asked a few of my Christian friends: “As a Black Christian woman, how do you see yourself? Which descriptor comes first to you: Black, Christian, or woman?” The answers differed, but in some form, we all agreed that the three do not operate individually; they were collective. Our varied experiences as women, as Black women, and as Black Christian women have all contributed to our narratives, understandings, and interactions of our faith and the world. If this does not give too much away before your lecture, what inspired you to research on Kendrick Lamar? I began with puzzle pieces and the masterpiece followed. I knew I wanted to study the relationship between Christianity and secular rap music as I have sometimes met disdain from others because I enjoy secular rap music. Also, my younger brother, Malcolm Xavier, was a huge supporter of my interest in the complexities of Black masculinity, Christianity, and secular rap music. I knew I wanted to study these complexities in a way that did not look to demonize secular rap. As I unpacked my research on Black Liberation Theology, Black Radicalism, and secular rap music, I realized I wanted to examine how Black Christian men used secular rap music as part of their socialization and personal expression. Later, those ambitions turned into a textual analysis on secular lyrics. Enter Kendrick Lamar. His album, good kid, m. A. A. d city(2012), had just dropped, and his lyrics made headlines left and right. He also had an incredible body of music to study. The beauty began to unfold throughout my entire writing process. Looking back, it was incredible. Your talk will be on the intersections of faith and Black masculinity in the context of Kendrick Lamar’s music, and you have mentioned you have a graduate certificate in Women’s Studies. What advice would you give to current students who are not considering WGS as a major or minor (or even a course in their undergraduate studies) about the value of a course in WGS? I would ask “why deny yourself such a good thing?” Just start with one course and allow yourself to grow in it; it will truly strengthen your perspective–not only on other people’s experiences but also your own. My own Women’s Studies courses helped me formulate a language to tell my own story that was so empowering. Regardless of your gender or gender identification, I think a WGS course offers what many courses do not always allow—another voice, seat, perspective, lens. And that is essential because we are not designed to live life in a vacuum. You were designed to intertwine with people who have stories different from your own. It is dangerous to live in a monolithic world because you deny yourself the good fortune of growing in an awareness that will only strengthen you as you continue to live in this world. If you could teach any WGS course, what would you title it? Who is one person you would include on the syllabus? Why? I would teach a course on Black women artists who use their platforms for social activism. I would include Jenifer Lewis, actress and author of The Mother of Black Hollywood: A Memoir (2017), on the syllabus, and I would petition for her to lead a lecture. Lewis’ boldness is beautiful; she speaks on mental illness (a taboo topic for many within Black communities), on social engagement, social responsibility, personal growth, accountability, and more. What is a WGS book you read—recently or not so recently—that you would call your favorite? Why? I am currently reading Dr. Roxane Gay’s Bad Feminist, and it is incredible. I love her voice, her perspective, and her account of her experiences. Do you want to learn more? 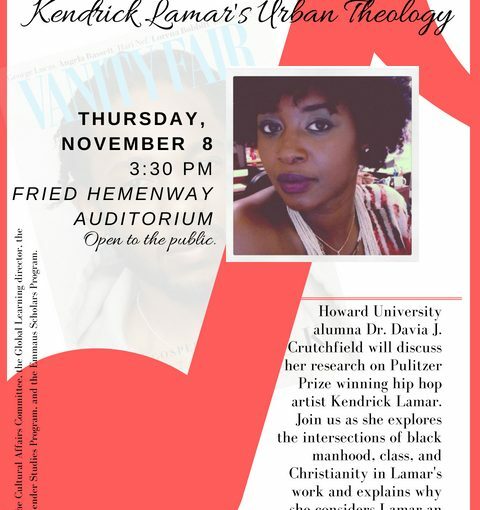 On Thursday, November 8, at 3:30 PM, Dr. Crutchfield will be speaking in Fried-Hemenway Auditorium at 3:30 PM on “Faith, Intersectionality, and Black Masculinity: Kendrick Lamar’s Urban Theology.” On Friday, November 9, she will be speaking on “Unfinished Business” in Dimnet Chapel at 10:30 AM and guest teaching Dr. Kendra R. Parker’s “The Secular and the Sacred: Black Biblical Appropriations” cultural heritage course at 12 PM. On Sunday, November 11, she will meet with the Black Student Union in the Bultman Student Center at 8 PM. All events are free and open to the public. Dr. Crutchfield’s visit is co-sponsored by the Women’s and Gender Studies Program, the Emmaus Scholars Program, the Cultural Affairs Committee, and the Global Learning Director.